NEXO’s brand-new family of low-profile high-output loudspeakers is aimed primarily at the installation and commercial audio market. The ID Series promises power and performance combined with versatility, making it suitable for a variety of install and touring applications. ID InSpace Definition describes a new category of products, which are intended as problem-solvers for the toolkits of system designers and installers in all areas of the audio business. The loudspeaker cabinets are super-compact and low profile, to enable their use in awkward and acoustically challenging spaces. Using a variety of mounting options, the ID24 compact cabinet can fit into almost any environment, whilst its ability to offer high SPL output with variable directivities enables it to ‘beam’ sound into difficult spaces. The ID Series is comprised of three products: the ID24 full-range compact speaker, using twin 4-inch drivers in a V formation in combination with an HF compression driver offering two preset directivity options. Complementing the ID24 are two striking low-profile powerful subs, ID S110 (1×10-inch) and ID S210 (2×10-inch). 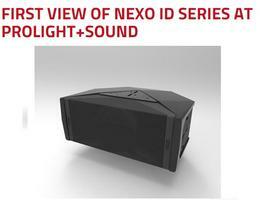 NEXO has designated three versions: ID24i for installation, ID24t for touring and AV applications, and ID24c which allows the customer to custom-configure the speaker to match precise requirements. The ID24 has a user-adjustable horn, which can be rotated easily without the need for tools by a switch on the rear panel to give 60 or 120 degree HF coverage with the standard horn fitted. This allows the HF horizontal dispersion to be tuned for the given application – installed or touring. As the ID24 can be mounted vertically or horizontally, this effectively gives the user four different directivity options in each cabinet. For AV and live music applications, the ID24t has a touring spec, featuring Speakon connectors and quick release rigging points for easy mounting – horizontally or vertically. The ID24t, also compatible with a range of NEXO and 3rd-party accessories, is available in black with a matching steel grille. The asymmetric shape of the ID24 cabinet further maximises its possibilities. The module can be mounted horizontally or vertically, and, using the correct accessories, can be deployed as an under-balcony reinforcement module. In live performance situations, the ID24 can pole-mount or clip onto truss. A purpose-designed accessory allows it to be precisely angled for stage front-fill applications. ID24 can even be used as a wedge monitor, when stood upright in the horizontal plane.